Hats and Rabbits: Me Chris...Me Like Bang Drums. I think I finally figured it out the gist of something. For years, comedians and critics of both sexes have been getting a lot of mileage out of joking that men are "simple" women are "complex." I think most people realize this is silly. All people are complex, even when they seem simple. The human brain is complex beyond comprehension, male or female. Still, it makes for good jokes and it seems true: men can appear to be simple oafs. But I think it has more to do with (can I use this term?) "primality" than with simplicity. Men are not, generally, simpler than women, but they have remained more connected to their primal roots than women seem to have. Maybe this means women have actually evolved further than men. I don't know. But I do know that even the most philosophical and most metaphysical of men still have a bit of the chest-beater in them even when they pretend not to. We want to be strong and tough. These two qualities might not be as immediately and as literally useful as they were when we were living in fear of being ingested by three-headed swamp creatures or of getting clubbed by someone from the tribe over the hill during a cattle raid, but the primal need for these qualities remains. How they manifest themselves is up to us. If we pick fights in bars, we are being morons. Those of us who do this are the ones who deserve the whatever oafish label they get. There are a lot of these guys around. The rest of us (the majority) tend to channel our strength and toughness into other directions. Sports, for one. In sports, we can be warriors for the required number of periods. No one gets killed, but we get to "fight" for a certain time -- we get to prove our toughness and strength. Sports are the most literal parallel to our survivalist/warrior ancestry. When we are not on the field, though, what do we do? Again, bar-brawlers are idiots, but the primal connection remains. I think we all need a way to assert our strength, because, for us, it is still important, even if it is not as important to our female counterparts and even if we think they value toughness in us more than they actually do. I know I lost my interest in sports some years ago, but I may not have if it wasn't for playing the drums. 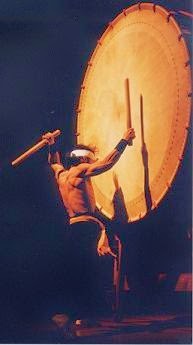 Drums are a physical instrument -- and talk about a literally and metaphorically primal thing... So, I admit it. There is a reason I play rock drums as opposed to jazz. I like to make loud noise; I like to drive a band; I like being able to play fast, strong drum fills. I take pride in my calloused hands. I like people to watch me play and to be impressed by my strength on the instrument -- but only if it amounts to the making of art. And for me, on drums as in life, strength without finesse and subtlety is just chest-beating. That's not simple, but it sure is primal.